It is the most expensive and sought after spice in the world, commonly known as red gold. At $65 per gram for the highest quality crop, Saffron can actually cost even more than the precious metal. Its value has been kept permanently high by labor-intensive harvesting methods that require around 200,000 delicate red strands to be hand-picked from 70,000 Crocus Sativa flowers for each pound. The undisputed capital for saffron production is Iran, where the tradition dates back over 3,000 years. The country produces over 90% of the 250 tons produced worldwide each year, boosted by unique ecological conditions that deliver a strong-flavored, aromatic crop that is a staple of local cuisine, cosmetics and traditional medicine. But business has been made harder for traders in recent years. The international sanctions implemented over the country's nuclear program have blocked access to the previously lucrative markets of Europe, the USA and Canada. Iranian companies and banks have been locked out of the global financial system. 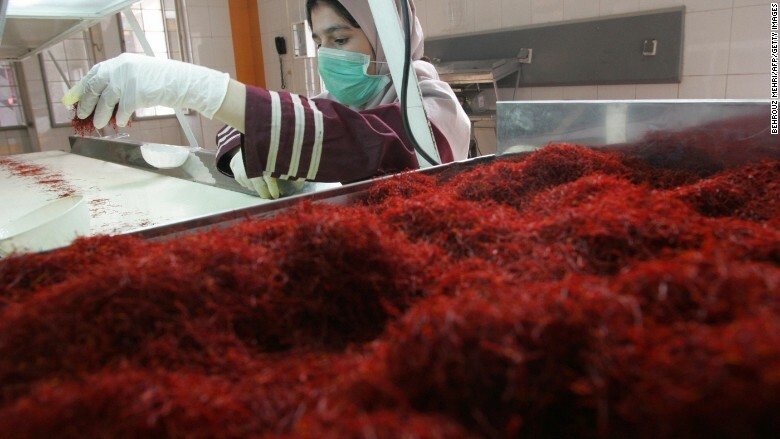 "We can't use banks," says Mehrdad Rowhani, CEO of Saffron Rowhani in Khorosan, the province which produces over 70% of Iran's crop. "We have to go through private messengers, who are expensive, and deal directly with customers and trust they will pay us. Sometimes they cheat." Other Iranian companies have even reverted to the barter economy to circumvent banking restrictions, with Chinese and Indian partners often paying for goods in shipments of food and consumer goods. But despite the difficulties, Rowhani has been able to maintain exports of 50 kilograms a month by reorienting his business to new markets in the Gulf and Middle East. Across the Iranian saffron industry as a whole, exports rose by 36% in 2014, according to Iran's National Saffron Council, and the price per kilo has risen slightly to around $2,000 per kilo. "Traders are very clever and when a door is closed they go through the window," says Ali Sheikh, the London representative of Iran Hassos Ltd, and a founding member of the British Iranian Chamber of Commerce. "None of the traditional items (including pistachios and saffron) remain unsold. The demand is greater than supply." Despite losing over $7 million a year in sales to the UK, Iran Hassos Ltd maintained a turnover of $48 million in 2014, similar to the pre-sanctions level, says Sheikh. The traders can still reach the West, by going through middlemen in countries such as the United Arab Emirates, although this has the downside of boosting competitors. "Afghanistan cultivate the stock they get from Iran, give it an original certificate and supply it to buyers," says Sheikh. "Saffron that comes to Spain is mixed with Spanish saffron and sold." 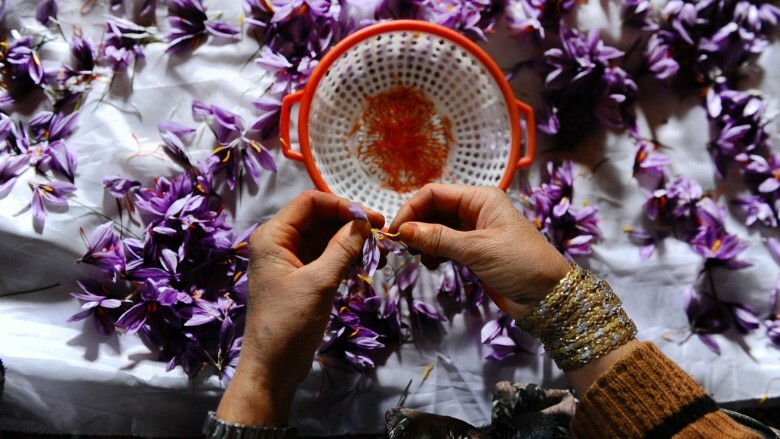 Picking saffron in Afghanistan, where the industry is growing rapidly. By some estimates as little as 1% of "Spanish" saffron is grown in the country. But despite these developments, Sheikh and other producers remain confident that the unique quality of the Iranian spice will maintain its position as the gold standard. The industry is also seeking to develop through new technologies and applications from saffron gum to medical treatments. The Iranian government has announced plans to encourage new areas for cultivation to increase the crop. Should the international sanctions be lifted, as has been suggested by the recent P5+1 talks, the new problem would likely be rocketing prices as demand greatly increased. Western companies are already lining up to invest in the putative new market, and saffron assets will be highly prized. In this scenario, Iranian traders would be richly rewarded for their resilience.